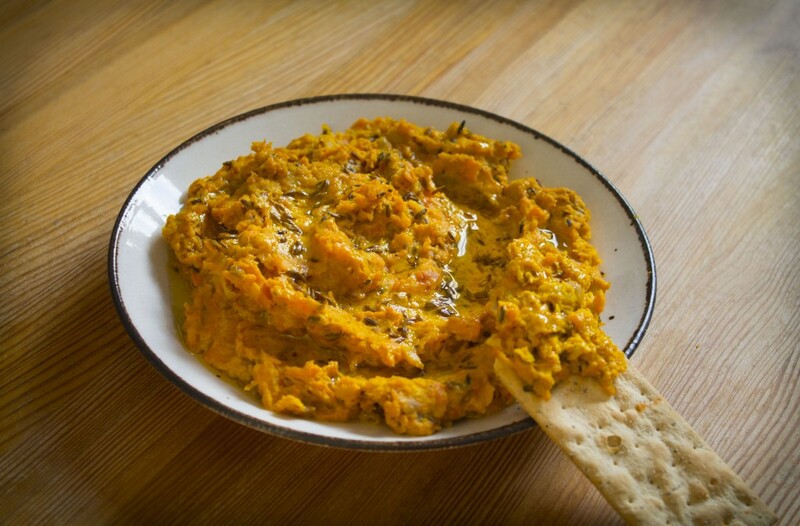 This simple recipe combines the sweetness of roasted carrots with the perfectly paired flavours of cumin and garlic for a delicious dip. It’s great with flatbreads, crackers or any vegetable crudités. Plus you can pick up a number of the ingredients from our traders at The Sidings N21. Preheat oven to 200c/180c fan/gas mark 6. Slice the carrots into thick rounds (2cm thick), spread evenly on a baking tray with the garlic and drizzle with oil. Scatter over the cumin seeds and season well with salt and pepper. Put the tray into the oven and roast for 25-30 mins, until carrot is tender and starts to colour. n to a food processor add the chickpeas, lemon, paprika, turmeric, tahini and when ready add all the roasted ingredients. Pulse together until you have a course mixture. Serve the dip into a bowl and drizzle with more oil and a squeeze of lemon juice. We hope you enjoy this free recipe. Show your support for The Hungry Bears’ Blog who created it, like their Instagram account by clicking here.